i came across olioboard over on decor8. then, holly mentioned there was a contest going on, so i decided to check it out. the challenge was to take at least three items from grandin road and put together a room. the items i chose are the metal side table, the blue side table, the bulldog and the black dresser. i really like how it came out. i love the little pops of orange and blue and the repeating curves from the metal table in the wallpaper and clock. if you like it, maybe you will head over and vote for me? pretty please? and now? i am completely addicted to olioboard! 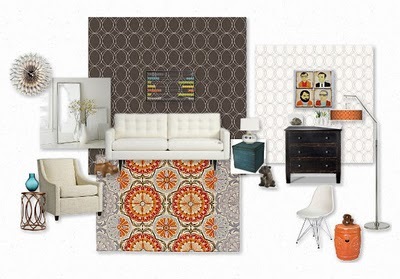 what a fun way to put together a mood board! so much easier than tearing things our of magazines and catalogs, don't you think?